A Flipbook is a way of displaying a pdf document online so that it has the look-and-feel of a paper-based magazine, one whose pages you can turn using a mouse (desktop) or finger (mobile). Unless you’re using a mobile. I could talk about stuff like whether this creates a greater sense of engagement among students than the bog-standard static pages of a pdf file, but since I’ve got no idea (and I don’t know of anyone who’s bothered to try to find out) that would just be me trying to find a deceptively- plausible way to encourage you to try them. So, if this Big Build-Up has piqued your curiosity and / or whetted your appetite for Flipbooks you’ll be pleased to know I’ll be adding a variety of the little blighters to this page on what might be charitably termed an ad-hoc basis (translation: whenever I can be bothered or can find the time). Following hot on the heels of Defining and Researching the Media and The Ownership and Control Debate comes a new set of notes looking at The Selection and Presentation of News. News Values – more specifically, Harcup and O’Neill’s (2017) recent re-evaluation of their 2001 study that looked not just at possible changes to old media news values but also news values related to new media – Facebook in particular. Neo-Marxism – a few statistical updates relating to concept of hegemony and levels of trust in old and new media. New Right: I’ve expanded this section slightly to include new examples of anti-competitive behaviour in new media and I’ve added a short section on the Cairncross Review (2019) in the context of State attempts to regulate old and media to encourage competition and innovation. Postmodernism: This section has seen a fewer minor changes to clarify things like Goffman’s ideas about Frontstage / Backstage applied to new media and how Baudrillard’s concepts of simulacra and hyperreality relate to news selection and presentation. It’s quite a large file (18 or so pages) and, in places, a little complicated (particularly the postmodernism section). If you use this with your a-level students you may need to check that it’s an appropriate level. 1. Defining ownership and control – a brief overview of what we mean by these concepts. 2. Trends and patterns in media ownership is focused around concepts of media concentration and conglomeration. This section also includes an outline a various forms of media integration – horizontal, vertical and diagonal. 3. Theoretical explanations offers a couple of contrasting interpretations of the significance of media ownership and control: Marxism (considered in terms of its Instrumental and Hegemonic variations) and Pluralism (with a focus on concepts of globalisation and the audience selection model). As befits their textbook origins the Notes aren’t hugely-detailed (lack of page space being a prime, if not over-riding, factor in their construction) but they should serve as an introduction to the main themes and arguments in the debate. You might find them useful as a supplement to the other resources (textbook or otherwise) you bring to the table. * Philip Allan, in case you were wondering. They were promptly taken-over and banished from the face of literary existence by Hodder in a move that was probably unconnected with my personal trials and tribulations, but I like to think wasn’t. On the plus side, I did get paid. ** Ha. Who am I kidding? It was OCR. Kicking my heels between edits I thought I might dig-out some old Notes (they were originally written around 5 years ago for a professional publishing project that, for one reason or another, never came together) and knock them into some sort of shape in the sincere belief that someone might find them useful. This short Report, sponsored by the Lloyds Banking Group, asks the question “Does Advertising Reflect Modern Britain in 2018?” and answers it in a way that both GCSE and A-level Sociology teachers and students should find useful. In basic terms, it’s a big, colourful, pdf file in three broad sections available for viewing online or offline as a pdf download. 1. Key Findings does exactly what you might expect by pulling together a couple of A4 posters worth of information – covering things like ethnic identities and media representations and stereotypes – and presenting it in a clear, informative, way. 2. Findings goes into more detail about what the research discovered, with a few bits-and-pieces of interpretation thrown into the mix for good measure. There’s also an interesting little section on “ethic identity”, plus a short discussion of the relationship between ethic and gender identities. 3. Methodology. This adds a further dimension of usefulness as far as sociology teachers are concerned because it provides an opportunity to examine how a piece of research is constructed, particularly in terms of its strengths, weaknesses, reliability and validity. Understanding Media and Culture: An Introduction to Mass Communication (to give it its full title) is a textbook, released under a Creative Commons licence by the University of Minnesota, that’s free to read, copy and share – which makes it especially useful for schools / colleges or students on a tight budget. Under this particular licence you’re also free to adapt the work in any way you like (“remix, transform, and build upon the material”) and what this will mostly mean is that if you want to chop chapters or sections out of the textbook you’re free to distribute these in any way you like (you just can’t charge anyone for the privilege). In terms of content, the main body of the text dates from 2010 but there has been some updating in 2016 (particularly around the impact of new technologies) which makes it pretty up-to-the-moment as far as textbooks go. The emphasis on media and culture means that most of the text is given-over to an analysis of the cultural impact of different types of media, both old (books, newspapers, film and television) and new (video games, entertainment, the internet and social media). Each type is given their own discrete chapter which, among other things, looks at their broad development, relationship to culture and, perhaps most-interestingly, how they have been impacted by the development of new technologies. The remaining chapters deal more generally with a range of areas: concepts of culture, media effects (there’s coverage of a range of theories dealing with direct and indirect effects), globalisation, the relationship between the media and government and a final section on the future of the mass media. Each chapter also has its own learning objectives, brief summary and short exercises. Whether or not you find these useful is, as ever, a moot point. I’m personally not a big fan, but Publisher’s love them so we probably have to learn to live with them. Finally, one obvious drawback, as far as UK teachers and students are concerned, is that the cultural focus is largely North American. This means that many of the chapters draw on materials and examples that will be unfamiliar to any but an American audience and UK teachers who decide to use these chapters may want to take advantage of the aforementioned editing privileges afforded by the CC license. • Download in a variety of ebook formats (such as mobi and epub) or as a pdf file. Popular forms of postmodernism are arguably a feature of many forms of current journalistic analysis of social behaviour, in both main stream and social media, with a current “crisis of masculinity” being a firm media narrative. Locating such arguments in their historical context may, however, be a more-sociologically useful way to understand them at a-level. 1. An overabundance of choice relating to, in this instance, how to perform male and female social roles that leads, in turn, to confusion over both the distinction between – and content of – these gender roles. 2. A progressive loosening of the moral order, such that male and female identities that were once highly centred – “everyone” knew how they were expected to behave as “men” and “women” – have increasingly become decentred: the disappearance of a clear moral authority dictating “how to be” a man or a woman in contemporary societies leads to different people interpreting their different roles in different ways. Firstly, “historical development” is seen as a linear process – a straight line between “the past” and “the present” – that involves an evolutionary progression from “the simple” to “the complex”. Secondly, ideas and events are interpreted and reinterpreted in such a way as to remove them from their historical context. Rather than locating “the past” in its own particular and peculiar social context, ideas and events are “ripped from history” to be understood solely in terms of the meanings and motivations of those living in “the present”. While both of these ideas arguably represent a form of Functionalism in shiny new shoes, this is not to suggest popular ideas and debates about “a crisis of masculinity”, “toxic masculinity” or, moving further afield, concepts like “post-truth” are imaginary, unimportant or the product of that most-misused of ideas, “moral panics”. Rather, it’s to argue that these conditions need to be explained sociologically, with a clear eye on historical details and contexts. As a case in point, you can use the following article by Ellie Cawthorne (“How to be a Man: tips from 1930’s agony aunts”, 2018) to show how ideas about “changing masculinity” can’t be simply and easily explained by reference to the kind of nebulous references to “postmodernity” favoured by contemporary journalists and commentators. The article can be read online at the BBC History Magazine website or offline by downloading it as a Word document I’ve very thoughtfully assembled for your viewing pleasure. Because online documents have a habit of disappearing into the ether. Colourful PowerPoint Presentation summarising the OCR Globalisation and the Digital World Unit, plus a range of 6 / 9 mark exam practice questions. It’s somehow typical that you see nothing about this OCR A-Level Sociology Unit for months and then, just as you’ve posted a “6 week course” guide, you stumble across a couple of PowerPoint Presentations that actually complement this quite well. • What is the relationship between globalisation and digital forms of communication? • What is the relationship between globalisation and Conflict and Change? • Cultural homogenisation, hybridity or resistance? The second is neither Big, Bold nor Colourful because it doesn’t aim to be. It just wants to do its job quietly, efficiently and with the minimum of fuss. So, if you want to give your students some practice 6 and 9 mark questions, based around the PEEL mnemonic, this Presentation should fit the bill nicely. For those of you who just can’t get enough of free Knowledge Organisers, Learning Tables or Activity Mats, here’s a quick update on new materials. The Hectic Teacher has added 30 new Beliefs in Society “Topic Summary Sheets” to the existing KO’s on Education, Family and Crime. This is for the AQA Specification, but a lot of the information can be applied to OCR, Eduqas or CIE (but this will obviously involve a bit of work on your part…). These are all in pdf format but if you contact her and ask nicely they should be available as PowerPoint slides that can be edited to your particular lesson requirements. A-level (Socialisation, culture and identity, Research Methods, Researching inequality, Globalisation and the digital world, Crime and deviance – all aimed at the OCR Specification but, once again, there is a degree of information cross-over with other Specs.) and GCSE (Key Concepts, Families and Households added thus far, with many more promised). These are all available as PowerPoint Slides should you want to edit them in any way. 1. Check they are for your Specification – you don’t want to be revising the wrong Spec. 2. Check the Specification year / series to which they refer, particularly if it’s changed recently (over the past year or so). In other words, check the resources cover the newer required material and exclude older, newly-irrelevant material, from your revision. 2. Sociology Revision Guide: Although not as ambitious or comprehensive as the above – the focus is on key terms and Notes covering Methods, Family and Education, plus a short section in exam advice – this Guide by Debbie McGowan is nicely designed and makes a welcome addition to your revision armoury. Presupposing you have one. If not, you can start one with this. Back by popular demand and with a brand-spanking new set of Tables covering media, methods and education. Each Unit is by a different author and the quality is, at times, variable. These are a little older (2009) and again authorship is a little hazy. On the plus side they’re in Word format so they can be easily edited if necessary. Again, not sure who created these or indeed when they were created. However, they are in Word format if you want to edit them. 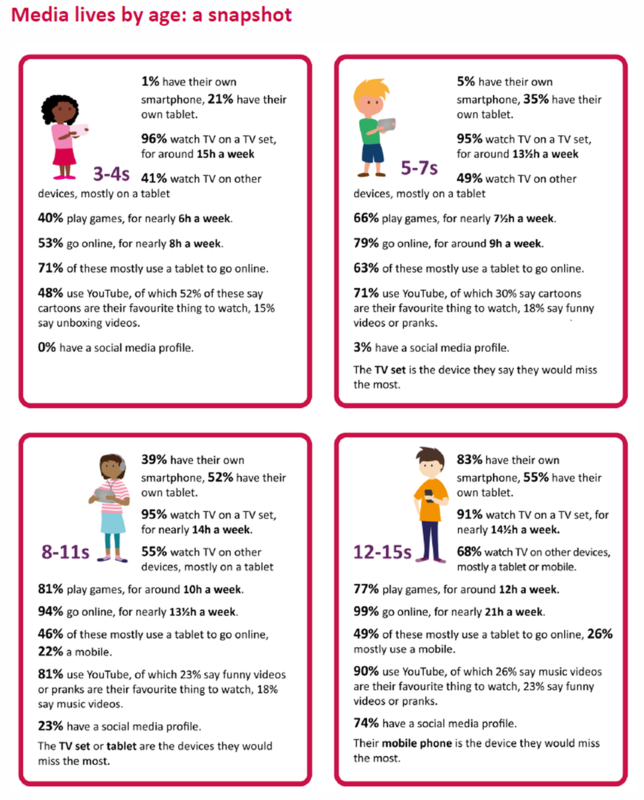 The 2017 OfCom Report on “Children and Parents: Media Use and Attitudes” (2017) covers different types of on-and-offline media use by children in the UK and it’s quite a treasure trove of visual and verbal information that will repay careful analysis – although at around 300 pages it may prove a little hard-going for most students. Luckily, there’s a really good Executive Summary that pulls-together a shedload of interesting empirical / opinion data and disgorges them into concise, bite-sized and consumption-friendly chunks. This section is something you or your students can easily browse, taking whatever you want from what is actually a very rich menu. If you’re interested in media and methods – and, let’s face it, who is? – there’s extensive details about the overall research methodology. It’s actually quite useful (in a sort-of “you know you should be interested in this stuff, but…” kind of way) because this knowledge lets you assess the likely levels of reliability and validity of some parts of the Report (such as interviews with parents about the media usage of their 3 – 4 year old children). If you do decide to take the plunge and swim down into the deep waters of the main section of the Report you’ll find it contains some very useful charts, tables and summaries about all aspects of children’s media use. However, if you’re anything like me the main takeaway from the Report is this rather neat little chart summarising “Media lives by age: a snapshot” – perfectly poster-sized for pinning on that pristine wall.